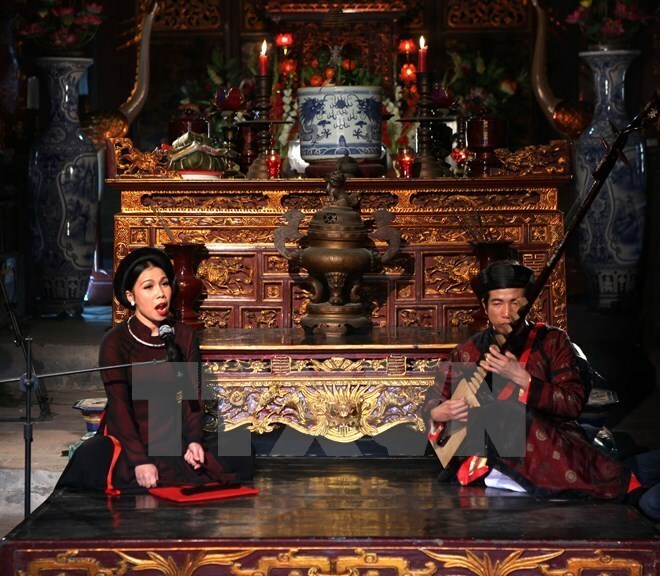 Hanoi (VNA) – The Ky Uc Ha Noi (Hanoi Memories) programme that opened at the Thang Long royal citadel in Hanoi on December 30 night brought back the congenial atmosphere of old Hanoi to the dwellers of all ages and international visitors. In the colourful space of the ancient Thang Long citadel, a UNESCO-recognised world culture heritage, the programme was meticulously staged and arranged to feature uniquely cultural features of a thousand-year-old Hanoi. Visitors to the event can have a look at ancient Hanoi city gates, a model of an electric tram, an antique market, old streets, craft villages and streets, street music performances. Architecture, bonsai, craft products, Hanoi cuisine, old Hanoi costume, folk festivals and flower arrangement are pleasant sights for everyone at the event. The organising board also put up a “Hanoi Old Quarter” miniature with typical old streets beginning with the “Hang” name such as Hang Dao, Hang Gai, Hang Dong, Hang Khay, Hang Trong and other typical streets such as Lan Ong, Bat Dan and Cau Go. The street atmosphere back to the old days was also revived with artisans performing their skills on the sidewalks and women holding baskets and standing by bicycles full of flowers. Meanwhile, the “Old Hanoi Market” area introduces old hundred-year products like pieces of memories reminiscent of old Hanoi and is definitely an ideal place those who are nostalgic of old Hanoi. There are available folk games and hands-on experience on making traditional toys such as masks, locusts made from leaves. Art programmes such as blind street music, ceremonial singing, the performance of musical instruments, street music groups or calligraphy performance are interesting aspects of the event.